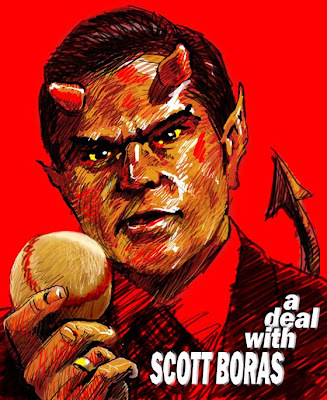 Last week, the New York Times reported that Scott Boras, one of the most successful, high-profile baseball agents in the world, has been giving loans to the families of young baseball players in the Dominican Republic, then using the leverage that those loans gave him to coerce the players to sign with him. While some bloggers noted that "no harm was done" in this case, and Boras did not technically violate any laws, giving personal loans to impoverished baseball prospects one is hoping to represent certainly seems unethical. Sadly, shady dealings are standard operating procedure for baseball prospect recruiters not only in the Dominican Republic, but also throughout much of Latin America. Latin America has long been known as the “wild west” of baseball recruiting; with little to no government oversight in place, it’s common for young players to take steroids and to lie about their age in order to look more attractive to Major League suitors, and buscones—self-appointed talent scouts who encourage these behaviors—roam freely about the landscape. A better description, however, might be a “gold rush.” Increasingly, it seems that people are looking at poor but athletically gifted Dominican boys (some as young as 13) the same way 19th-century prospectors looked at hills and streams—there could be gold in them there prospects.